According to a source in one of the delegations, Ukrainian conflict and the fight against terrorism were among the main topics discussed by G7 leaders during the second day of the summit in Germany. GARMISCH-PARTENKIRCHEN (Sputnik) – The Ukrainian conflict and the fight against terrorism were among the main topics discussed by G7 leaders during the second day of the summit in Germany, a source in one of the delegations told RIA Novosti Monday. “The important topics in today’s plenary session were the Russian-Ukrainian conflict and fight against terrorism,” the source said. Earlier, sources said that the Ukrainian conflict would be included in the final summit communique. The G7 comprises leaders of Canada, France, Germany, Italy, Japan, the United Kingdom and the United States. 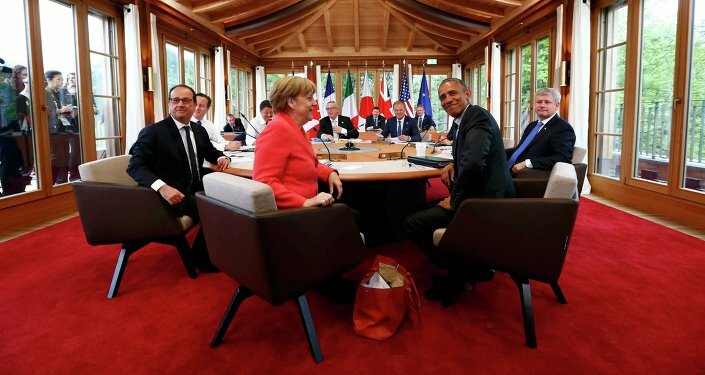 The 2015 G7 summit began in Bavaria’s Schloss Elmau hotel on Sunday. Apart from the Ukrainian crisis and counter-terrorism efforts, the agenda includes migration policy and climate change issues.